Chief Minister Pema Khandu conveyed his heartiest greetings on the auspicious occasion of Sarok festival celebrated by the Akas of East Kameng district with traditional fervor. Mentioning that Sarok celebration marks the prayer to Mother Earth for well being of all mankind, Khandu offered his prayers for peace, prosperity and progress of every community of Arunachal Pradesh. “Sarok is an occasion for all people to come together and simply be happy. Let’s celebrate happiness and spread happiness across our beautiful state which is distinct for its diverse communities, traditions and culture but take pride as one people and one nation,” Khandu said in a message here this evening. “As Sarok drives away evil spirits, let’s drive away the evils of hatred, violence and corruption and join together to take our state on the path of accelerated development. Let’s all join our Aka brothers and sisters of East Kameng and join in their celebrations,” he added. 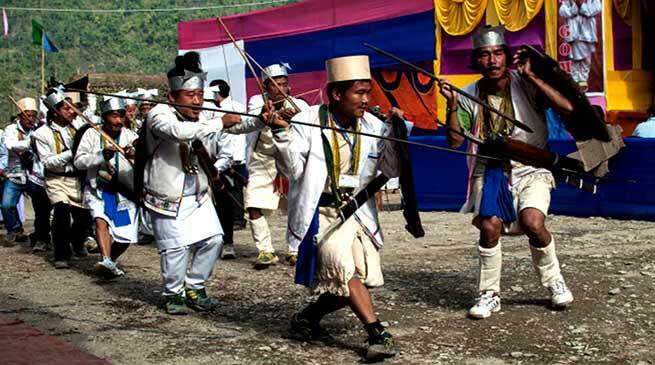 The Chief Minister congratulated the Akas of East Kameng for keeping alive their culture and taking pride in their heritage while emphasizing for the umpteenth time on preservation of the indigenous identities that is distinct only to Arunachal Pradesh.